as evidenced here, here, here, here and here. Yeah, I am a tad fanatical about Candlewick. a full table using Candlewick. months ago at Burlington Coat Factory. for the 4 pack of napkins! I layered a cream napkin with the paisley to break up the pattern a bit. The napkin rings were a gift from Mr. B. The black placemat also helps to break up all of the pattern. purchase at only $1.99 each. were on sale at Michael's, $1.00 each. were my grandmother's and my most prized possession. I am so happy I am finally using them! purchased at an estate sale. 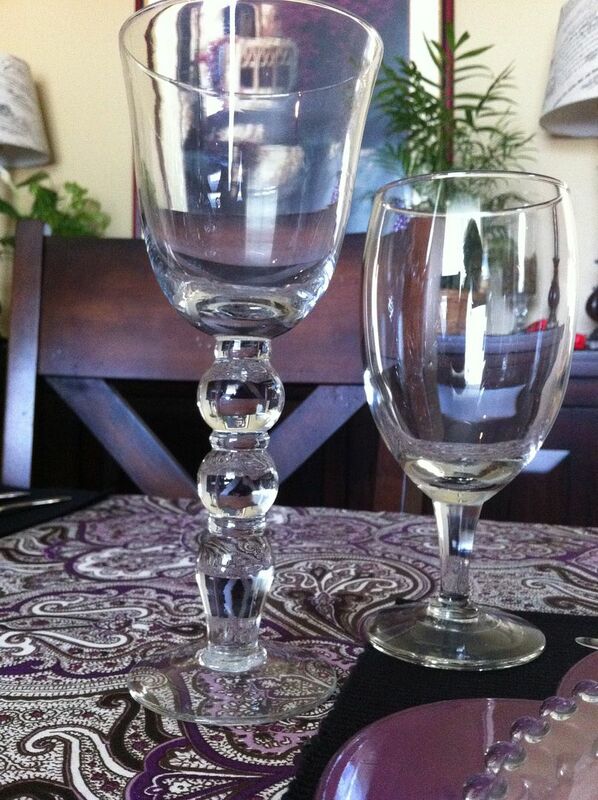 The bubble goblets are a thrift store find for .25 each. when paired with our everyday water goblets. You may remember the candles from this post. The candlesticks are my "go tos"
and were a gift from my oldest son. some special memories of our own with them. Beautiful Kathe! I love how rich the colors are! Good job Kathe, love the Candlewick place settings. I too love the Candlewick and your table setting is gorgeous! Oh, I love candlewick dishes! My Mother in law had a wonderful set and when she downsized one of her daughters got the set. I do have two platters I got at thrift stores awhile ago. Anyway, Your table is so lovely and I love the colors you choose. Thank you for sharing. beautiful! can't wait until I can set out my grandmother's dishes without fear of them breaking LOL! This is so pretty! I love it! Well done! So pretty, and the purple is so nice!!! Happy VTT! Thanks for sharing today! That purple and silver are such a stunning combination. 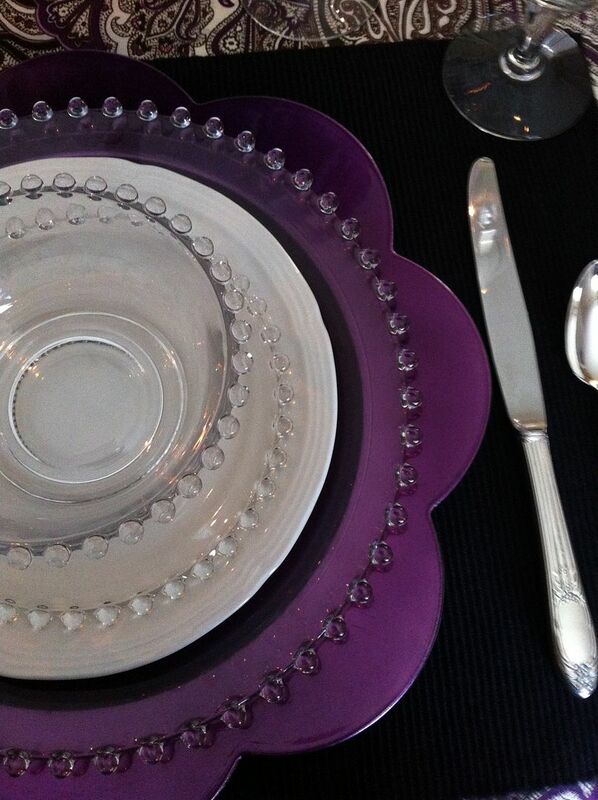 I'm sure your grandmother would be tickled "purple" to see her Candlewick plates set so beautifully. Amazing photos too! I love the Candlewick! Beautiful table. I just purchased those same chargers at Michael's but have yet to put a tablescape together with them. 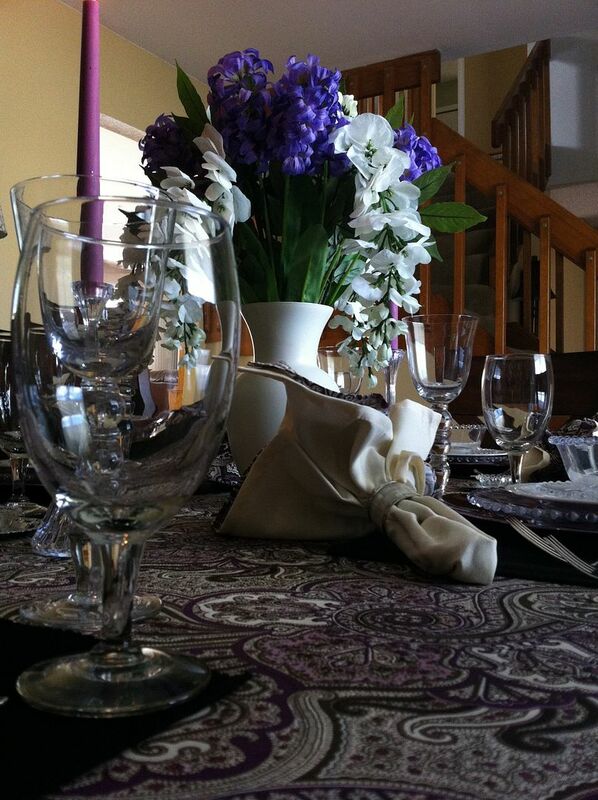 Purple is my favorite color and I really love your tablescape, those linens are beautiful and I LOVE the Candlewick!! I have a few pieces that I have picked up at GW's here and there but I didn't know anything about it. Thank You for sharing!! I can't take my eyes off of the paisley to see anything else. I love it so much. I think paisley looks so sophisticated and classic. Love this!! THanks for sharing at our party this week. Get outta here! You got those beautiful goblets for just 25 cents each?!?!?!! I am SO definitely shopping in the wrong thrift stores!!!! And I saw the tablecloth & napkins at our local Burlington, but it was not priced that generously!!!!! Your Candlewick collection is beautiful, and I'm especially taken with the salt cellar. I'm such a big fan of those! It must do your heart good to be able to enjoy what your Grandmother started all those years ago. Have a beautiful weekend! How wonderful to have these special treasures from your grandmother. It always feels so wonderful to think of all the times they have been enjoyed before you. You put together a lovely table! Candlewick is one of my favorite vintage glass patterns. How nice to have such a lovely collection! And your table is gorgeous!! Beautiful and I LOVE that tablecloth! Glad you set your table with the candlewick for it is very elegant. 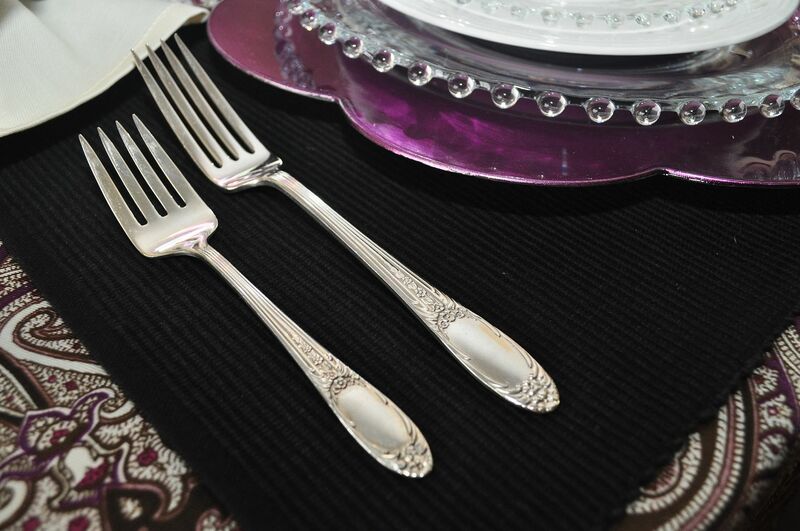 The heirloom from your grandmother is wonderful and then your adding to the collection is very sweet. 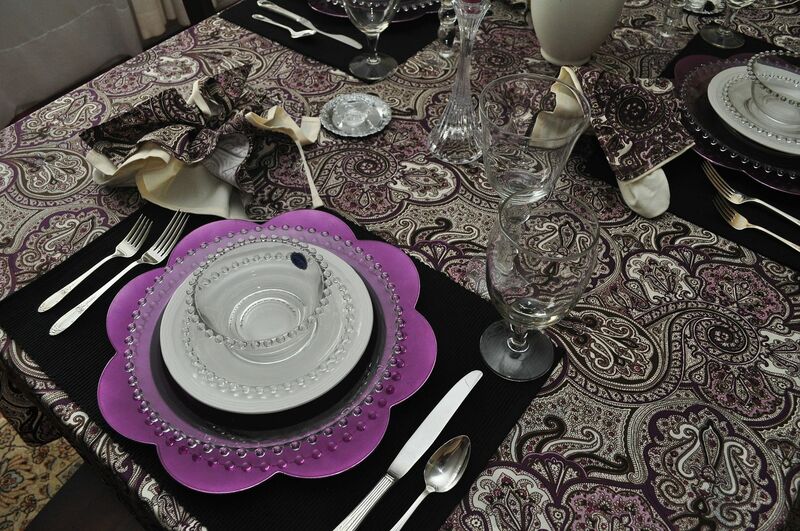 The purple paisley tablecloth is lovely but the price is even better. I must check out Burlingtons. I LOVE the purple and silver together. It's absolutely beautiful. 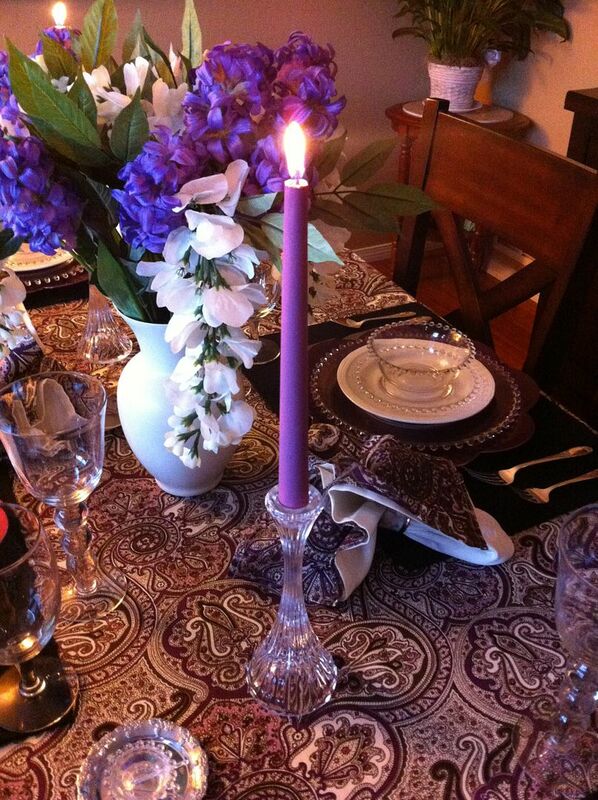 Your candlewick tablescape is beautiful! I have started using the candlewick that I inherited from my dear Mother more & more for family dinners. I like to place something seasonal, like a fall leaf, shamrock, etc. under the dinner plates for everyone to enjoy. On my recent trip to Missouri I saw a few pieces in antique malls that were too pricey for my pocket book. Candlewick is a real treasure. Glad you're using yours. What a beautiful table you've set with your lovely collection of candlewick. Beautiful things make for a lovely table. More purple! I love it! I am so happy to see an entire tablescape with Candlewick. It is so uniquely beautiful. What a wonderful treasure your grandmother left you. I'm sure she would just love this table! Have I mentioned I'm also a paisley freak? I have the matching placemats, but haven't used them yet. Good call on the napkins. The solid one really makes the paisely one pop without being too busy. Haha, I almost bought those purple chargers, but decided on the green. For $1, I may go back and get the purple, too! Thanks for sharing this wonderful purple table. I will definitely be back on the 24th to see what you are up to! 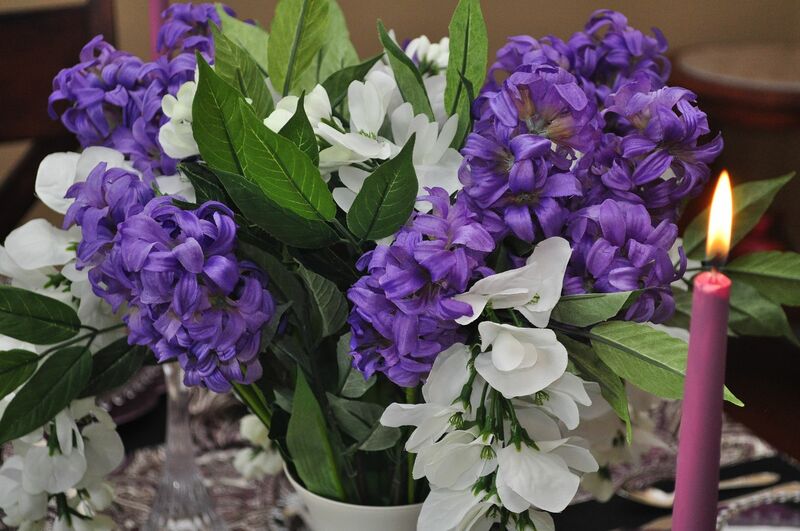 This table scape is absolutely gorgeous! I love the paisley! Very nicely done! 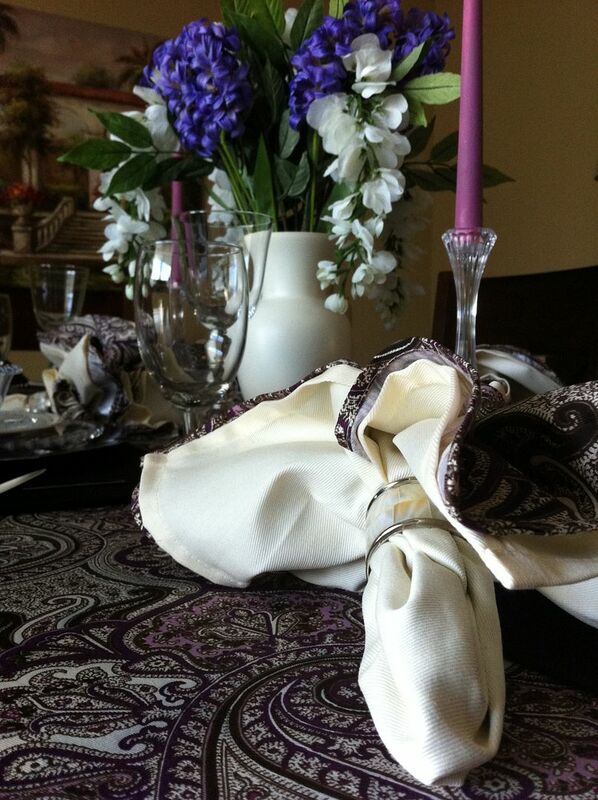 I especially like the tablecloth and the napkins for color and the place settings are so special! I'm a new follower hopping from Katherine's Corner. The Thrifty Blog Frog http://thriftyfrogblog.blogspot.com. Oh wow! I love your tablescape. The tablecloth really plays up your dishes so well. What a beautiful table! 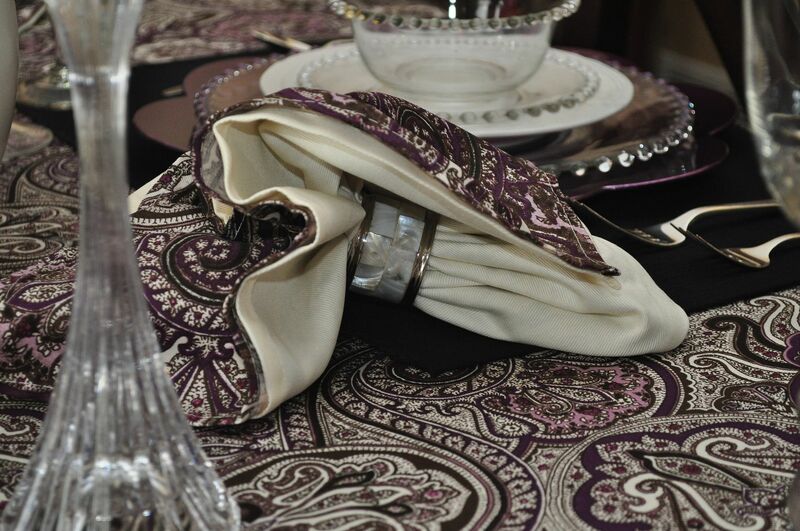 I LOVE paisley and have never seen purple and your dishes look wonderful on the tablecloth. 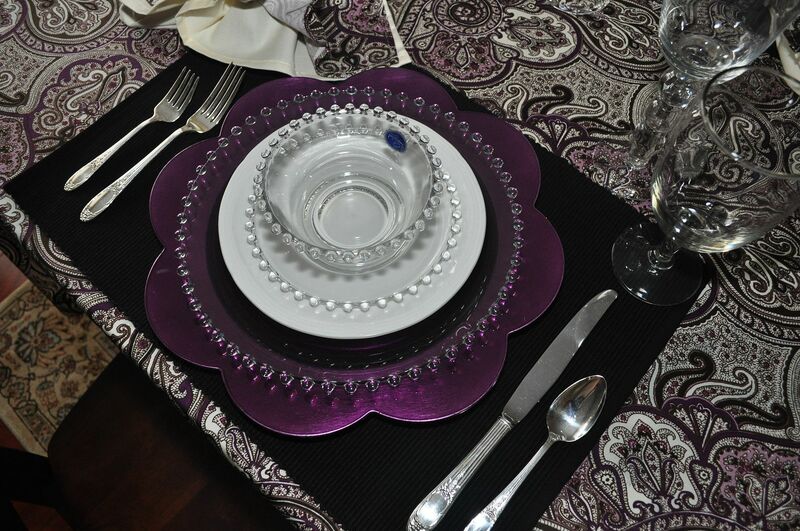 It is so nice to see more purples being used in tablescapes...very lovely. The tablecloth is gorgeous. Love the candlewick. How lovely! So glad you linked to Things I've Done Thursday! Your table turned out gorgeous Kathe! I love that you used purple. It showes up the beautiful glass wonderfully! Thanks for joining TTF and have a terrific weekend! 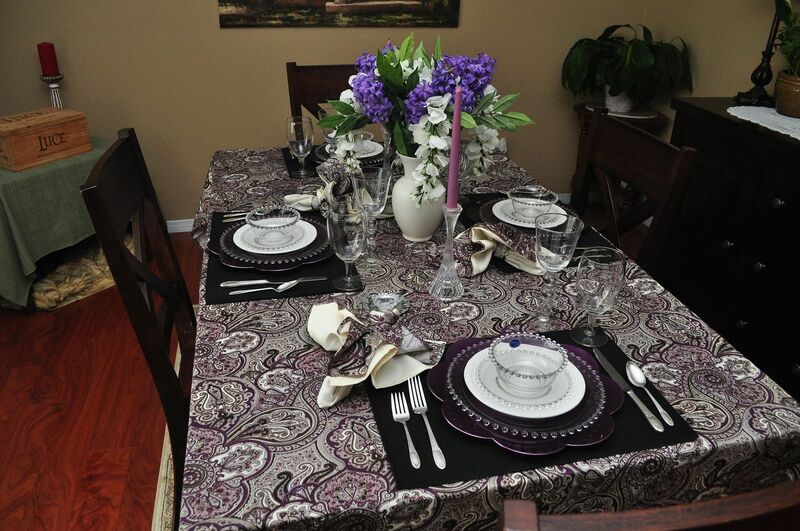 I was drawn to your post when I saw the purple table setting, which is not a common choice, and I absolutely LOVE it. Not being an entertainer, I don't have pretty china/dinnerware, but that doesn't mean that I don't love seeing a pretty tablescape. This is such an elegant tablescape - love the candlewick paired with the paisley tablecloth - all so very lovely and jewel-like. I love candlewick... it reminds me of my grandmother. You have a lovely collection! 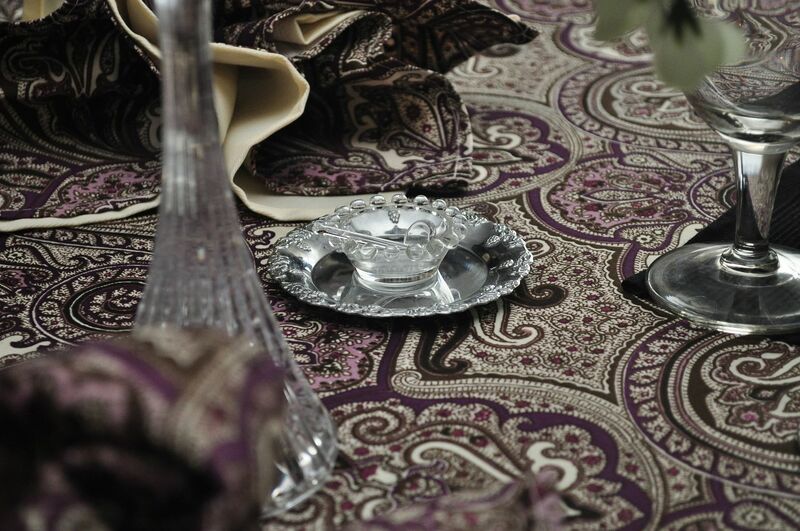 Your candlewick table is gorgeous and that paisley is the perfect backdrop. Thanks for linking up at this week's BFF Open House! Gorgeous and my fav color too. Thank you for linking to the Thursday Favorite Things hop. Hugs and happy weekend wishes! 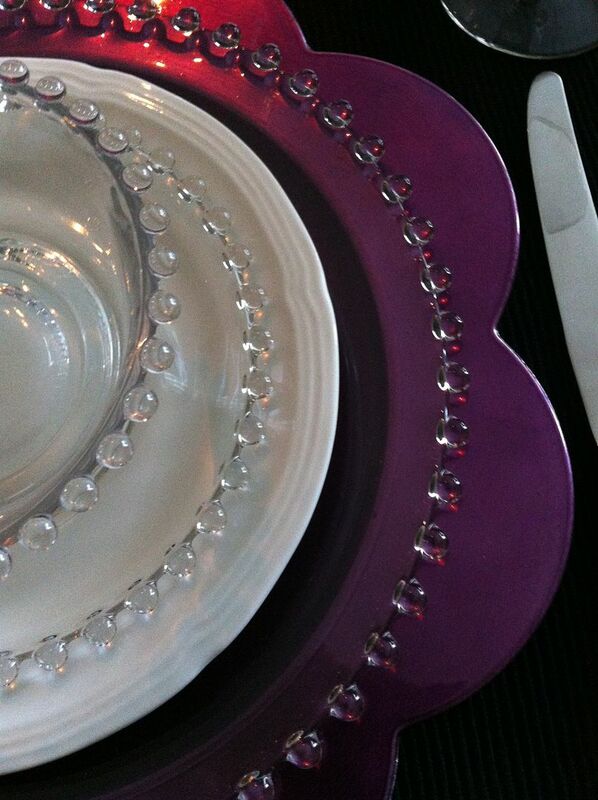 I love how you paired the dishes with the purple--so dramatic! Your candlewick is wonderful ... how special some of the pieces were handed down in the family. I love the purple! 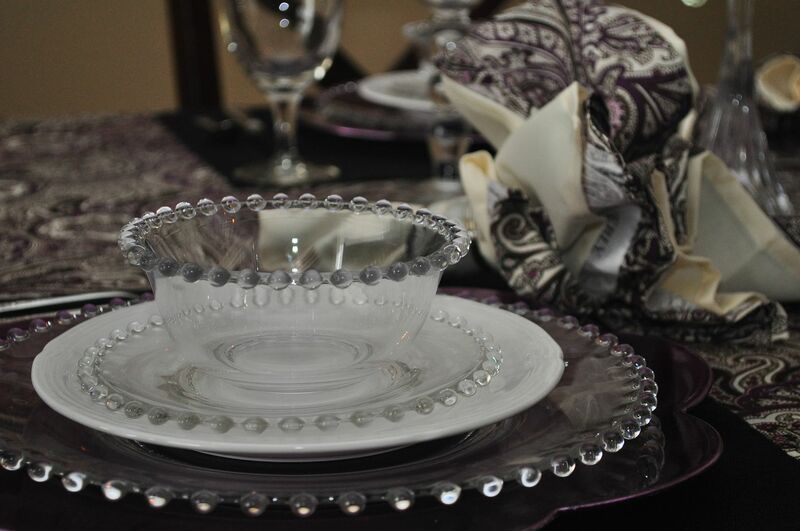 Your candlewick dishes are so pretty and how wonderful to have them from your grandmother. I bought the same tablecloth from the same place but mine is round. What could be better than purple and paisley? 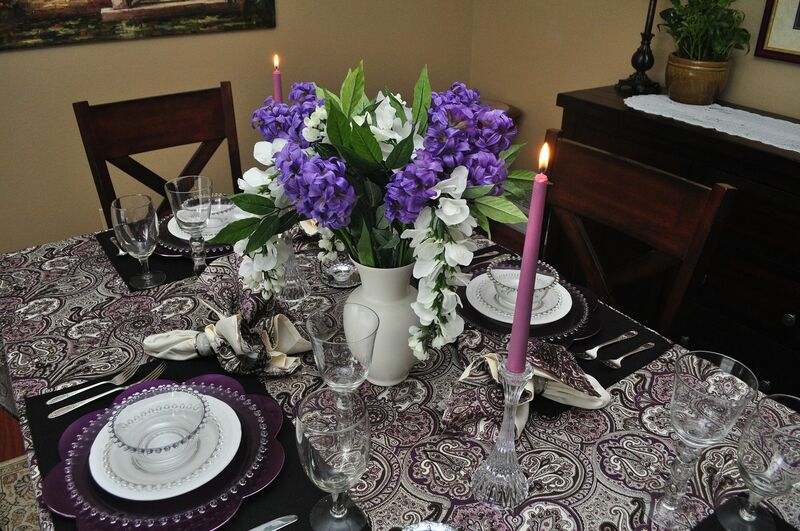 Beautiful table, I have been enjoying the purples and lilac colors I am seeing all Spring. Thanks for sharing. Wow, I just love that table cloth and napkins (and I love the price too!) Lovely table! Wow! Your tablecloth is stunning! 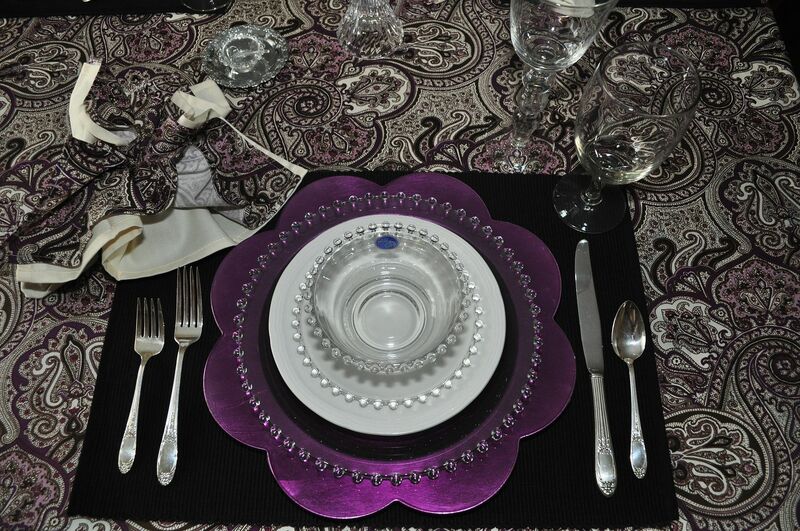 Its color and designs reveals its glory and it's perfectly matching the entire dinner wares! So dramatic and stunning - as always! That is absolutely gorgeous! I just love all that candlewick! Simply beautiful! The tablecloth and napkins are fabulous! A very lovely tablescape. I also love the candlesticks your eldest son bought you, very lovely. Your tablecloth and napkins are beautiful. Congrats on starting a Link party - a lot of work. I'll be back tomorrow! Thanks for sharing your creative inspiration at Sunday's Best Par.tay. Thanks for sharing this with us at The Sunday Round Up. The table looks great. Your table is just beautiful! What a good job you did--and how wonderful to use the dishes that mean so much to you. It's great that you're making your own new memories with them; they'll be even more special to you now! Just lovely. Thanks so much for being a part of Seasonal Sundays. Be sure to check out my recent post and GIVEAWAY announcement. Thanks to you, I love candlewick now too! Another beautiful table. Love the color. Thank you so much for linking up on Fabulous Friday at Faith, Trust & Pixie Dust. Absolutely beautiful setting. I love the purple. Thanks so much for sharing at Whimsy Wednesdays. LOVE your table! Thanks for linking up to the Tuesday To Do Party! Hope you'll come again this week! This month's Pretty Packages party is now up for any of your lovely wrapped gifts! This is beautiful, Kathe. I missed it! It must have been the week of my Earth Day party! Love the tablecloth and napkins. I always forget to look in Burlington, the closest one is about an hour away, but I don't know if it carries housewares. I have to check!